This bestselling textbook provides an engaging and user-friendly introduction to the study of language. 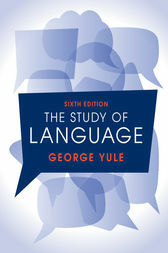 Assuming no prior knowledge of the subject, Yule presents information in bite-sized sections, clearly explaining the major concepts in linguistics through all the key elements of language. This sixth edition has been revised and updated throughout, with substantial changes made to the chapters on phonetics, grammar and syntax, and eighty new study questions. To increase student engagement and to foster problem-solving and critical thinking skills, the book also includes twenty new tasks. An expanded and revised online study guide provides students with further resources, including answers and tutorials for all tasks, while encouraging lively and proactive learning. This is the most fundamental and easy-to-use introduction to the study of language.